BIENZ, Elisabeth, wife of J. Bienz, born 30 July 1836, died 7 February 1913. Jakob Bienz, born 1 April 1825, died 17 April 1908. Jacob Bienz birth/baptism record, Gerlingen, Germany. Jacob Bienz, age 24, was living in Willshire Township by 1850, staying with the George and Mary Schumm family. Perhaps he was originally there to help the Schumms with the farm work, but he also met his future wife there. Jacob Bienz married Elisabeth Pflueger near Schumm on 21 August 1851. Both were from Zion Schumm’s parish. Her name is shown as Lissabetha in their church marriage record. They were married by Zion’s Rev. George Streckfuss. Elisabeth was the daughter of Christian and Anna Barbara (Sekel) Pflueger. Christian, Anna Barbara, and their six children emigrated from Wuerttemberg in 1832 and lived in Holmes County, Ohio, for several years before settling near Schumm. Elisabeth Pflueger was born in Holmes County on 31 July 1835 and was baptized there, at Zion Church, Winesburg, on 5 October 1835, according to the records of Zion Church, Winesburg. Jacob Bienz and Elisabeth Pflueger married the next year. I have a personal interest in the Pflueger family because Elisabeth’s older sister Anna “Barbara” Pflueger married immigrant Johann “Ludwig” Schumm and they are my great-great grandparents. Elisabeth (Pflueger) Bienz is my second great-grandaunt. 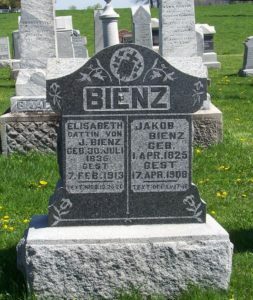 Jacob Bienz died 17 April 1908 in Schumm, at the age of 83 years and 17 days. He was buried on the 20th. Zion Schumm’s records indicate that he was survived by his wife Elisabeth and 7 grown children. His funeral text was Rev. 17:18. There is some conflicting recorded information concerning the dates of Elisabeth’s birth and death. The Winesberg church records indicate she was born 31 July 1835. Her tombstone indicates she was born 30 July 1836. Zion’s records indicate she was 77 years, 6 months, 7 days old, which would make her date of birth 30 July 1835. She was reported as being 14 years old in the 1850 census, which would also make her year of birth as 1835. I feel the Winesberg church record is the most accurate record, since it indicates she was baptized 5 October 1835. Zion Schumm’s records indicate she died 6 February and her tombstone and her death certificate indicate she died 7 February. 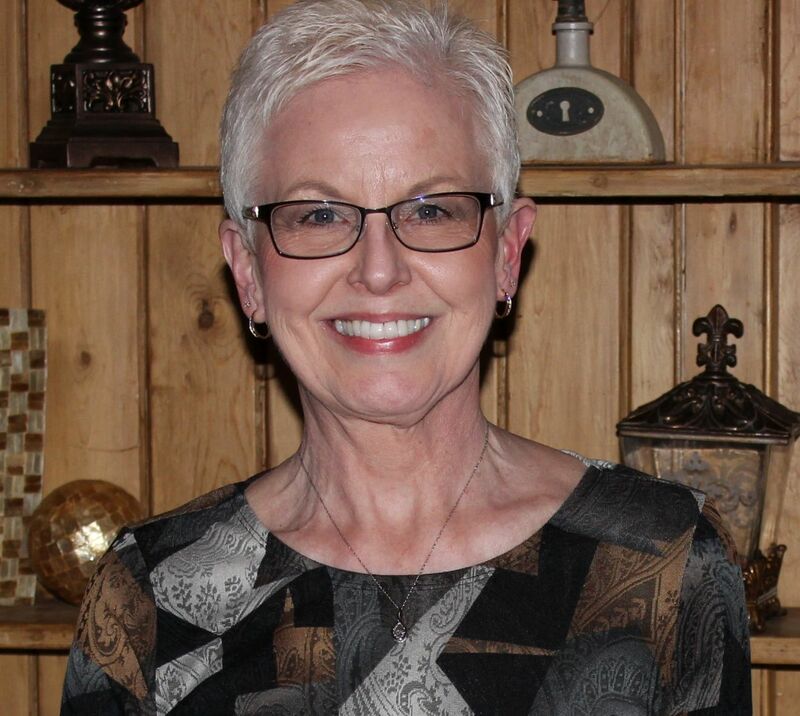 The death certificate is likely the most accurate for her death date. Lutheran Taufen, Tote, & Heiraten, 1564-1875, [Baptisms, Deaths & Marriages], Gerlingen, Wuerttemberg, 1823 baptisms, Jakob Bienz, 1 Apr 1825; Ancestry.com, tree of klicen, viewed 2 Apr 2019. According to Sutton’s 1882 History of Van Wert and Mercer Counties, Ohio, p.258, one John B [Balthas] Bientz immigrated in 1838 with his wife and ten children. The family settled in Tully Township and about 1850 two of the sons, Jacob and John, settled in Willshire Township. 1850 U.S. Census, p.166B, dwelling 114, family 131, George Schumm; digital image by subscription, Ancestry.com (https://www.ancestry.com/search/collections/1850usfedcenancestry/ : viewed 8 Apr 2019). 1860 U.S. Census, Willshire, Van Wert, Ohio, p.151 (penned), dwelling 1079, family 1073, Jacob Bentz; digital image by subscription, Ancestry.com (https://www.ancestry.com/search/collections/1860usfedcenancestry/ : viewed 8 Apr 2019). 1870 U.S. Census, Willshire, Van Wert, Ohio, p.15 (penned), dwelling 107, family 108, Jacob Bence; digital image by subscription, Ancestry.com (https://www.ancestry.com/search/collections/1870usfedcen/ : viewed 8 Apr 2019). 1880 U.S. Census, Willshire, Van Wert, Ohio, ED 154, p.14 (penned), family 117, Jacob Bienz; digital image by subscription, Ancestry.com (https://www.ancestry.com/search/collections/1880usfedcen/ : viewed 8 Apr 2019). According to Zion’s records, Vilenna was the daughter of L. Bienz, whom Jacob and Elisabeth took in to raise. This record appears to indicate that one of the parents was deceased, and since their son Louis died in 1940, it may have been the mother, Anna M. Chilcote. Louis Bienz and Anna Chilcote married in Van Wert County on 2 Jan 1879. 1900 U.S. Census, Willshire, Van Wert, Ohio, ED 98, p.310A (stamped), dwelling 208, family 214, Jacob Bienz; digital image by subscription, Ancestry.com (https://www.ancestry.com/search/collections/1900usfedcen/ : viewed 8 Apr 2019). 1910 U.S. Census, Willshire, Van Wert, Ohio, ED 113, p.9A (penned), dwelling 114, family 116, Charles H Kruckeberg; digital image by subscription, Ancestry.com (https://www.ancestry.com/search/collections/1910uscenindex/ : viewed 8 Apr 2019). “Ohio Deaths, 1908-1953,” Elizabeth Bienz, 7 Feb 1913; database with images, FamilySearch.org (https://www.familysearch.org/ark:/61903/3:1:33SQ-GPJ5-6ZJ?i=918&cc=1307272 : viewed 8 Apr 2019), Willshire Twp, Van Wert County.